I'm a nervous wreck every time I visit the Dentist. Dr. Patel, his staff and office are simply amazing. They assured me that I was in good hands and I definitely felt that way throughout my visit. They are extremely warm,friendly and patient. 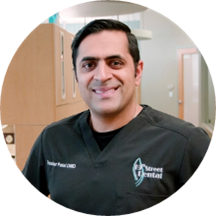 Dr. Patel took the time to thoroughly explain what was going on with my teeth and gums and his recommended treatment plan. I highly recommend his services to all my fellow nervous dental patients! He was very kind even though I hadn’t been to the dentist in a couple years. He was very thorough in explaining how to improve my teeth health. The staff was all kind too; they pointed me on what to do for my first visit. Very informative and professional, would recommend to any and everyone. I was seen immediately after filling out paper work! The staff were extremely friendly. Dr Patel spent time getting to know me and explaining things medically. My insurance and costs were explained before any procedures were done so there wereno surprises. "Extras" (teeth whitening) weren't pushed on me. I highly recommend this dentist! I'll admit, I'm someone who absolutely hates going to the dentist and have never found or met one I've liked, but Dr Patel is AMAZING. He's knowledgeable and takes the time to not only explain whats being done, but ensures youleave with knowledge about your teeth and maintenance that you never had before! I haven't had all of my work done yet but would highly recommend. Office is clean, brand new, and staff is great! Definitely will be going back. Backstory: I haven't been to the Dentist in nearly 2 years for a cleaning. Not because I was scared but because I thought it was going to cost me $$$$$ SO after starting a new job with great dental coverage, Idecided to go on ZocDoc and schedule an appointment with Dr. Patel. For one: Todd and Stephanie at the front are GREAT and make appointments/sign-in a BREEZE. Secondly: Dr. Patel and the dental assistant made the New Patient Appt comfortable and fun! #photoshoot #winningsmile Third: Dr. Patel took me to review my x-rays to get on the same page about the expected line of treatment for everything that I wanted to accomplish *very personable and knowledgeable*. He made me feel comfortable and dare I say "excited"? Last (and probably most important): As you can imagine, 2 years without a cleaning left a lot of room for build up and so I needed a deeper cleaning than normal. I was a bit scared at this point, but the Hygenist (who's name has slipped my mind) made sure I was comfortable the whole time. I had no pain and walked away with beautiful, white, healthy teeth that looked 10 TIMES better than when I had come in!! In the end, I was beyond satisfied with this experience (and quite impressed) and plan on handling all of my dental needs at 19th Street Dental for as long as I live in Atlanta. You should too!